I can’t believe it has been two weeks since my last post. The time has just disappeared in a cloud of paint fumes and dust sheets, and that pretty much sums up my house at present. We have made the last mad push to get the house tarted up for sale. We are now in limbo land, waiting for a new carpet, some new blinds and trying to paint the last bits of woodwork to finish off. Thanks to all of you for your ideas on my last post about brightening up the laundry wall. I was inspired by the idea of framing some fabric, but decided to use paper instead. On my lunch break at work I nipped into hot dollar and found some nice wrapping paper and three cheap picture frames, and framed the paper in each one to create a trio of artwork. 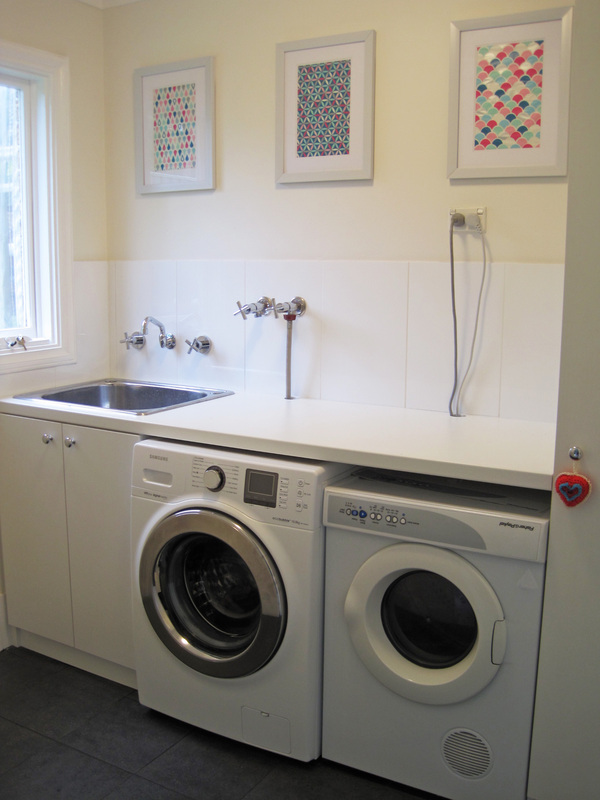 I scrubbed off the stickers on the washing machine and dryer so it all looks tidier in there now. 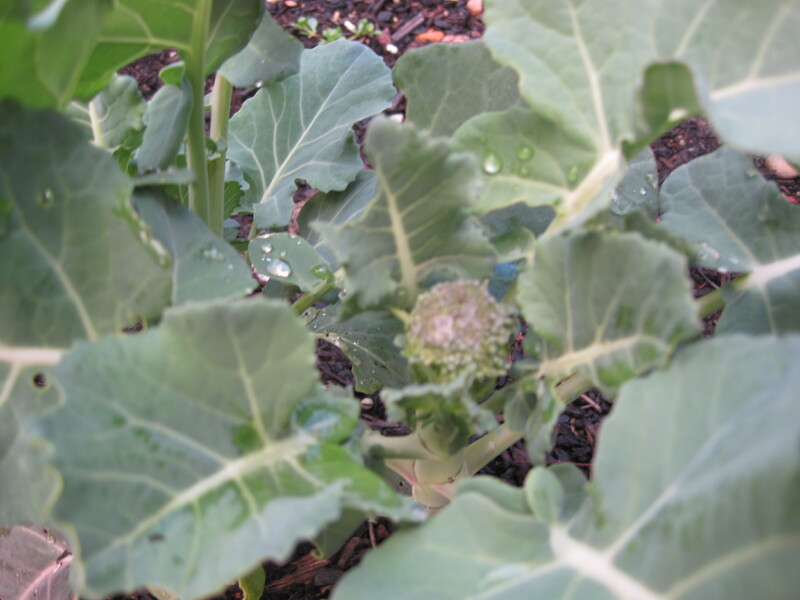 With all this rain lately there has even been some progress in the veggie patch, and we saw our first head of broccoli appear on one of the plants. Such excitement! 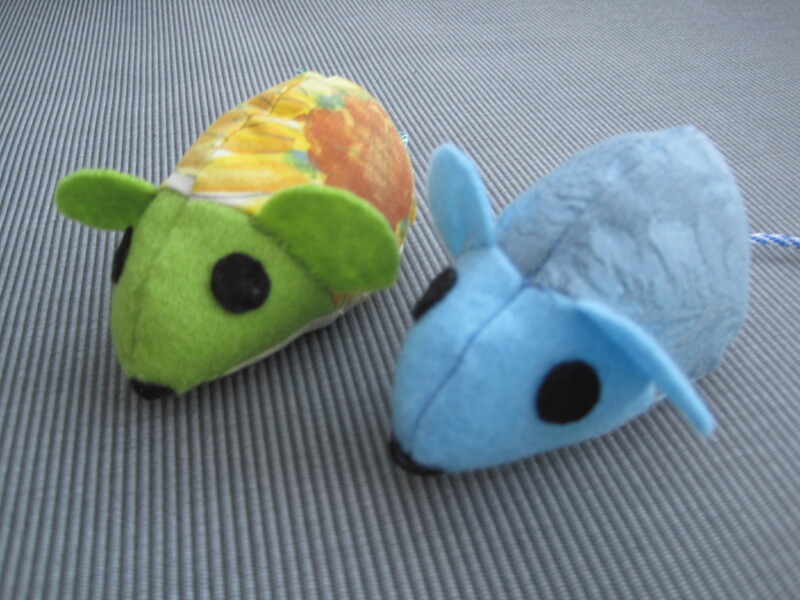 (sorry about the blurry photo). 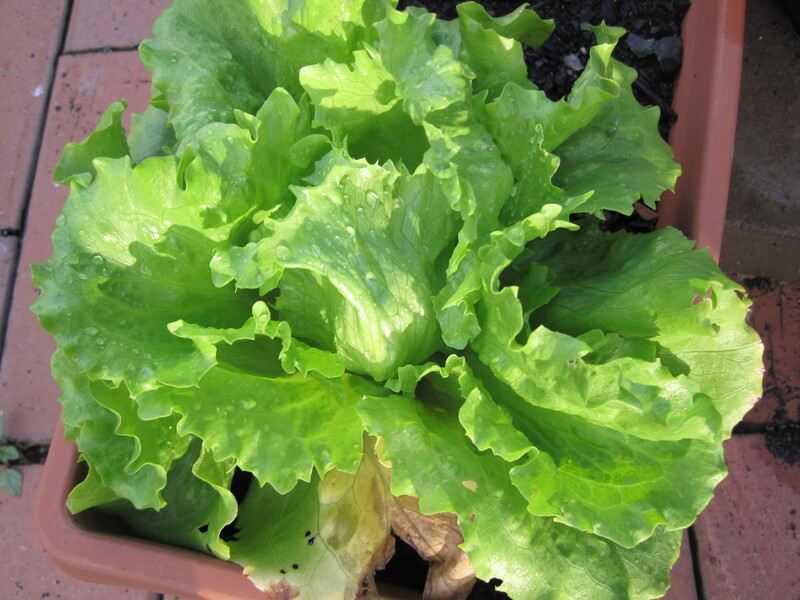 The lonely lettuce is doing well too. I was tempted to harvest it tonight for dinner, but the kids wanted it to grow a bit bigger. My littlest one and I planted some butterfly flower seeds back in april. These have given us a wonderful display so far with more to come. 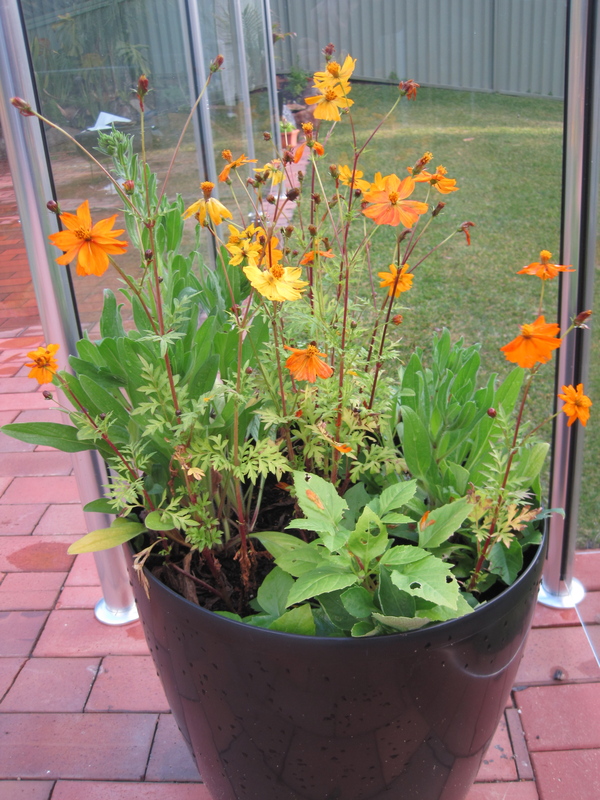 They were sown from a pack of fothergills seeds for kids to grow a flower garden to attract the butterflies. Of course I was not thinking this through, having just created a veggie patch. Needless to say we have been plagued by a few caterpillars from the white cabbage butterfly. I bought some Jamie Oliver greenhouse kits from woollies the other day as they are selling them off now at 2 bucks each. Bargain! 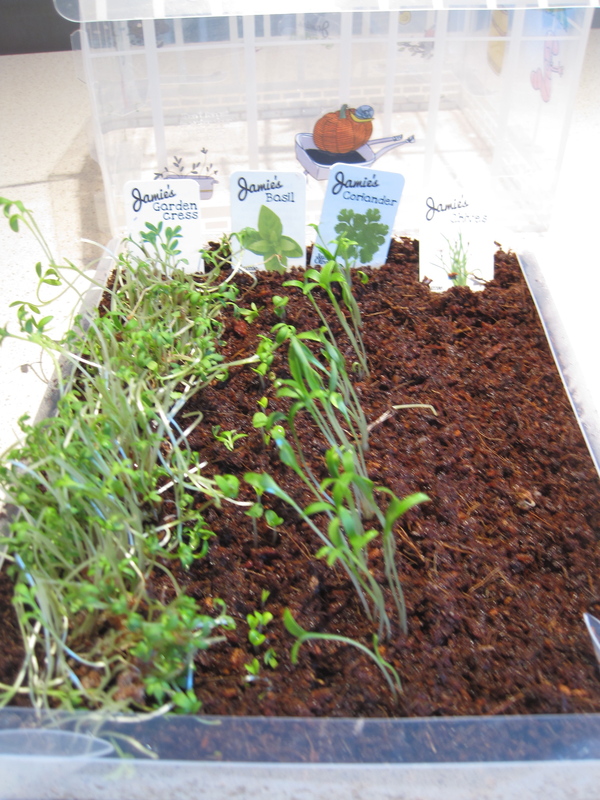 The kids are growing cress, chives, coriander and basil, all the sends came with the kit, so very good value. My basil in the garden died, so I am hoping for a good crop from these seeds. Sadly my knitting needles and crochet hook have been replaced with paint brushes and rollers these past two weeks, so nothing has been done there. 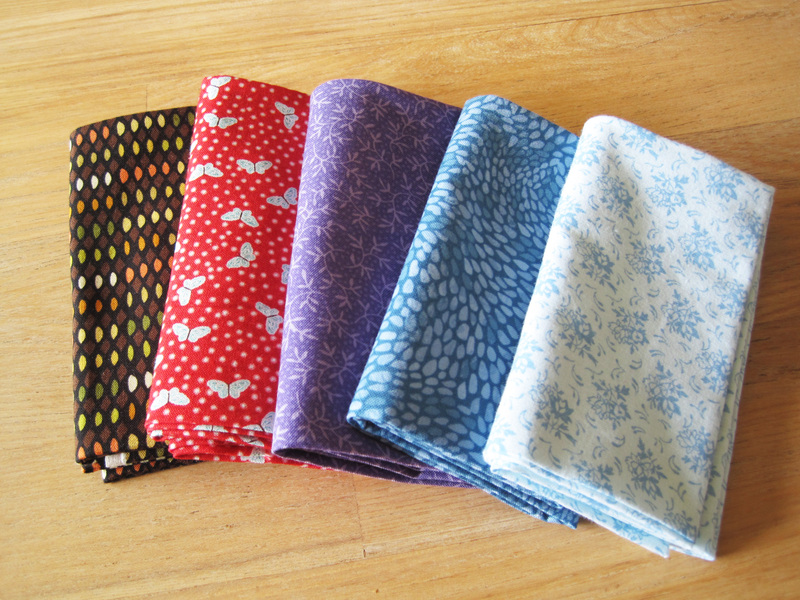 I did buy this little stash of fabric offcuts the other week which I am hoping to use to make some owls, or some babushka dolls. All this renovating has left me pretty exhausted I must say. 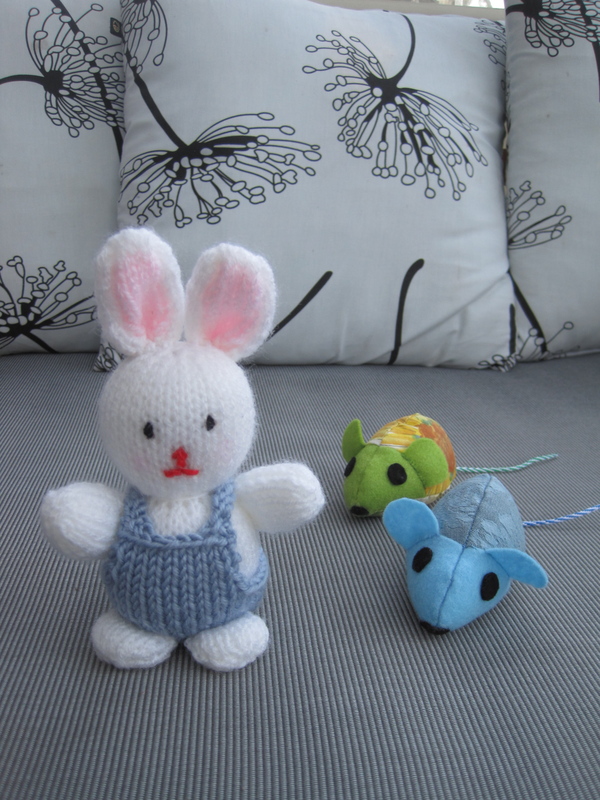 I am in need of some R&R so my plan is to do a little bit of crochet, something small and not too taxing. Now I am no carpenter. I’m not so great at DIY either, but I had a vision of something I wanted, but could not justify the budget for. 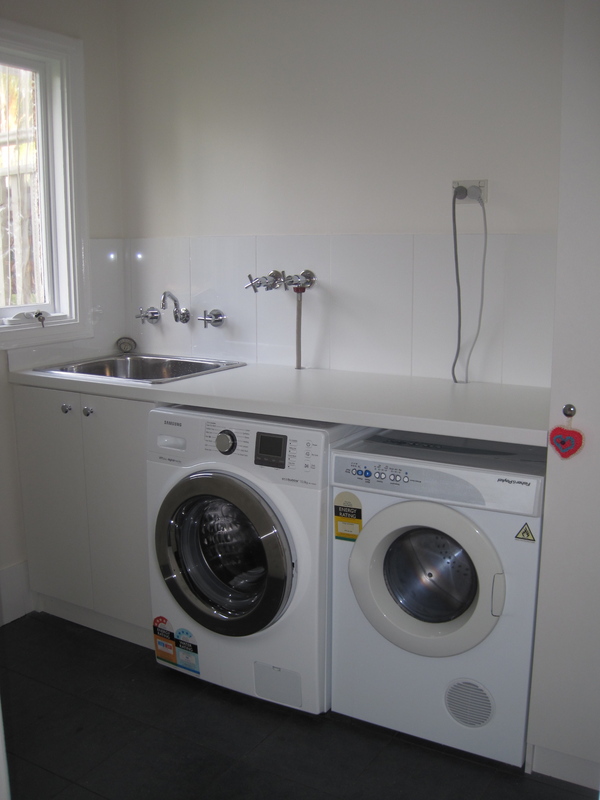 We recently renovated our laundry and downstairs bathroom on a tight budget. 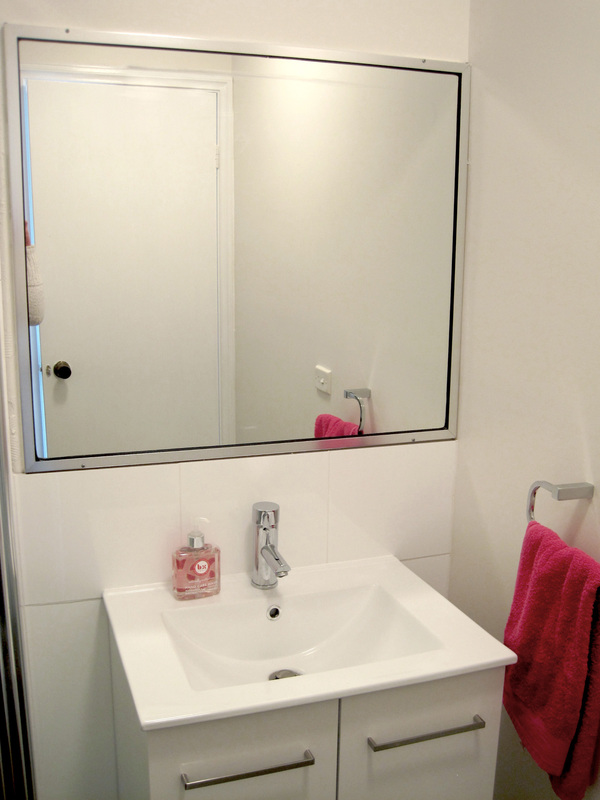 I am very happy with it, except for the mirror, which we did not replace. 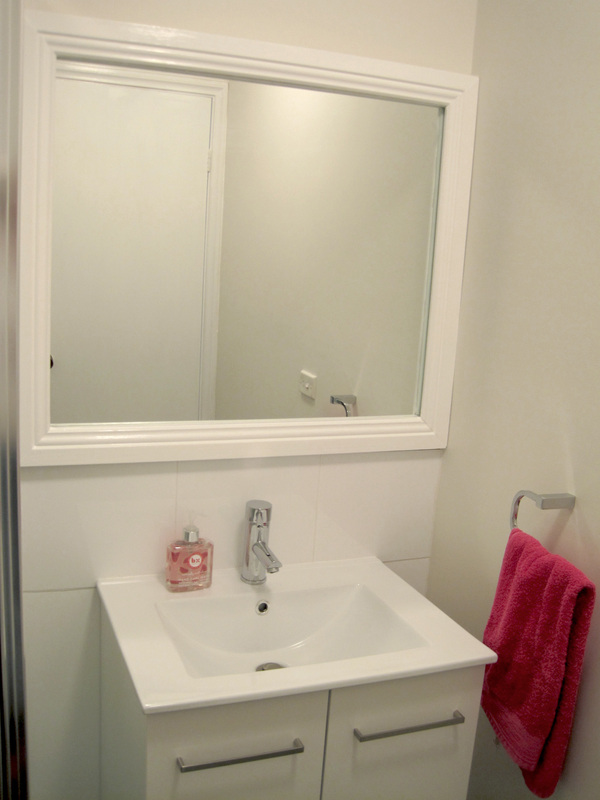 Now against the smart new tiles and bright new paint, the mirror just looks wrong. Old, dated and the screws along the metal frame, which I never noticed before, are now glaringly obvious. Not wanting to chuck out an otherwise good mirror I decided I would build a white frame for it. How hard could it be? My husband was not convinced. I told him I would get some architrave from bunnings and custom make a frame to sit over the top of the mirror, thus hiding the offending metal frame. He humoured me, saying it was a good idea, but mentioned the fact that we didn’t have any appropriate power tools for the job, and warned me that the hand saw I planned to use would not produce a ‘clean edge’ and was highly likely to be unstable and result in a lot of jolting during sawing and therefore result in a bad job. I decided to ignore his warnings and plough ahead regardless, saying ‘can I at least just give it a go, if it doesn’t work you can say I told you so’. After an hour of measuring and sawing (its quite hard work – no wonder they invented power tools) I had my frame ready to assemble. I assembled, filled the gaps in the joins (they were not perfect, but not bad for a beginner) then gave it a couple of coats of paint. Then fixed it over the old mirror. I was very happy with the result. Much better. Even my husband was impressed, saying it looked as if it had always been there. So all up it cost me 16 bucks. A new mirror would have been at least 50 bucks, with visits to several shops to get what I was after. Half way through the project when things we not going to plan, I was ready to throw in the towel and go ‘sod it, lets just go to Ikea’ but I soldiered on. Not bad for a weekend project, in between rushing off to soccer games and kids parties. I feel like Tara off Better Homes and Gardens! 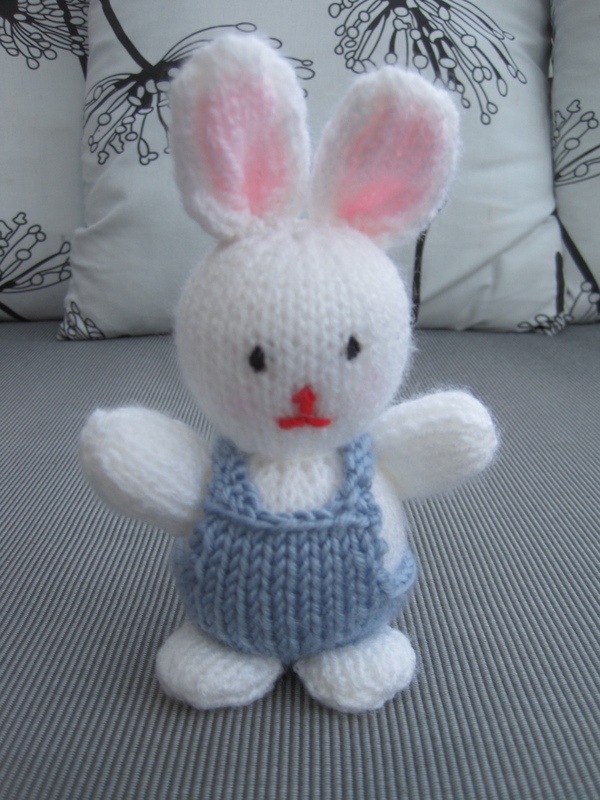 The past week I have been busy with birthday preparations for my daughter’s 9th birthday. After a little bit of label reading on packets of cake toppings, I have succeeded in having a little bit of colour in the party food and cake that is all natural. It always amazes me just how much artificial rubbish is in the products in the cake aisle of the supermarket. 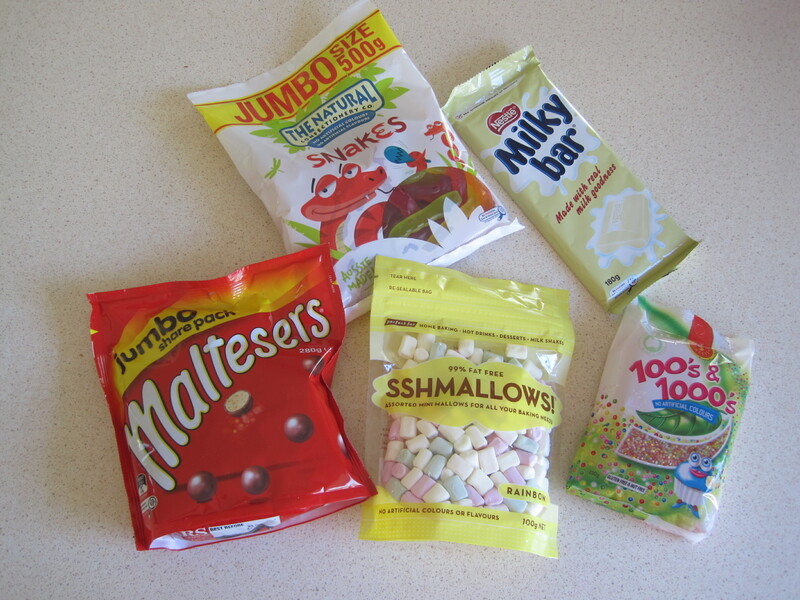 I feel so disappointed in the food industry in Australia. The amount of artificial additives allowed in our food that are known to cause adverse reactions in people is truly shocking. Ever since my son was 5 we have been careful to eat foods which are as pure and natural as possible, which mostly means homemade. We had a few issues at school, and we were struggling with his behaviour. 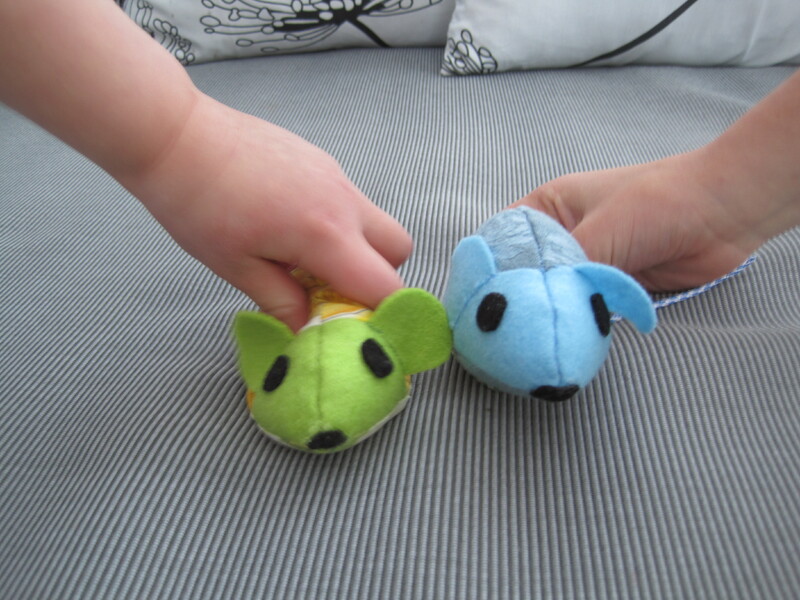 Another parent told us about the effects food additives had on children’s behaviour, and that many foods available in the supermarkets contained heaps of artificial preservatives and colours. She lent us a DVD about the failsafe diet. It made so much sense in relation to my son, we cut out food colours and other artificial additives in our diet, and saw a complete transformation in his behaviour. Unfortunately that meant that birthdays could be a little bit boring, and hard work. Fortunately, over the last 6 years I have noticed there is an increased demand for foods without artificial additives, and now there are more exciting things available to us using natural colours. Hurray! Some treats and toppings that use natural colours. Even 100s and 1000s! 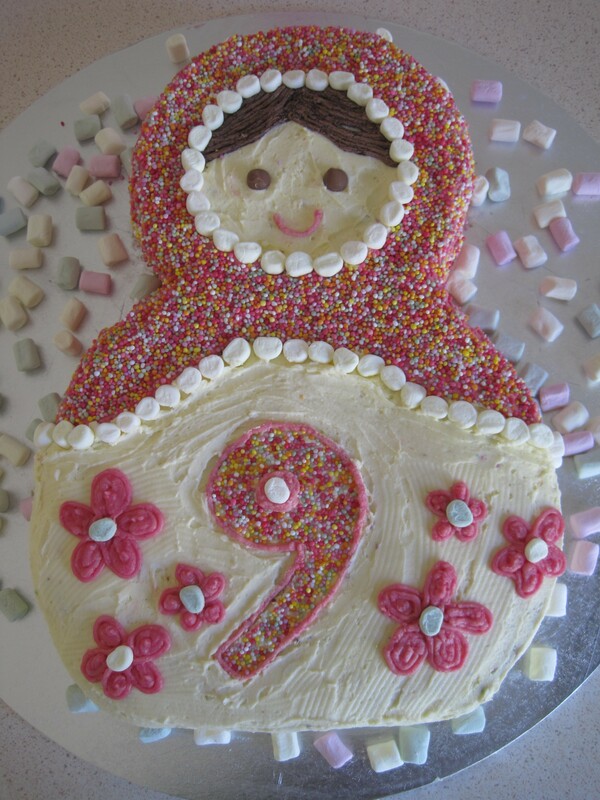 The Babushka doll cake is a basic chocolate mud cake that I made during the week, so all I had to do was decorate it at the weekend. 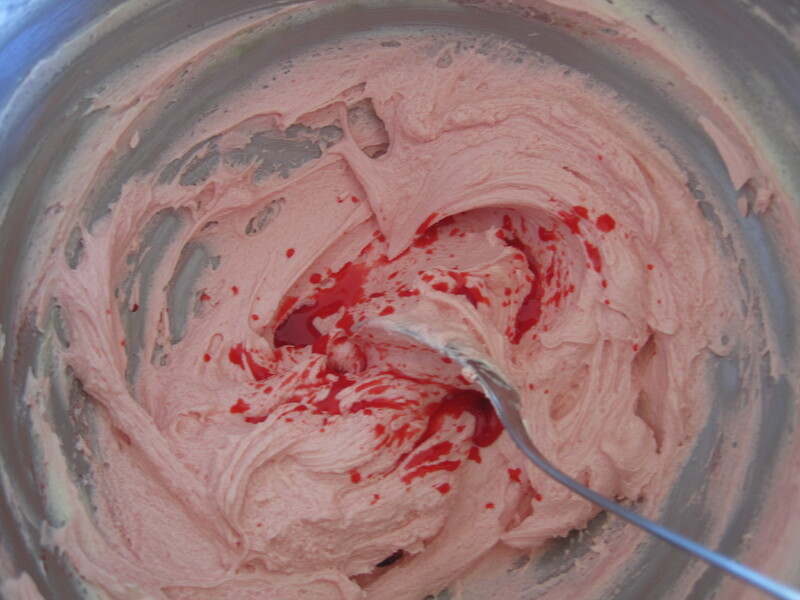 I made pink butter cream icing by making a basic buttercream mix then adding the water saved from boiling some beetroot to make the pink colour. Yes, beetroot! I thought it would be disgusting (beetroot flavoured icing anyone?) but amazingly, it has no flavour and the icing just tastes like normal buttercream icing, but is a lovely dark pink. How fab is that! Water from boiling beetroot added to icing to make pink! 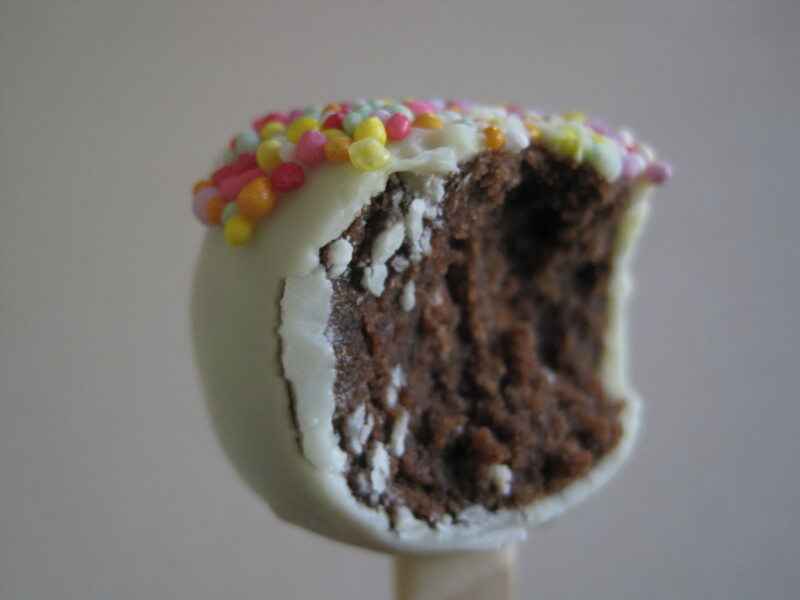 Cakepops were made with leftover mud cake from shaping the babushka doll. I broke the cake up into breadcrumbs, then mixed it with a little bit of buttercream icing, then rolled into balls. 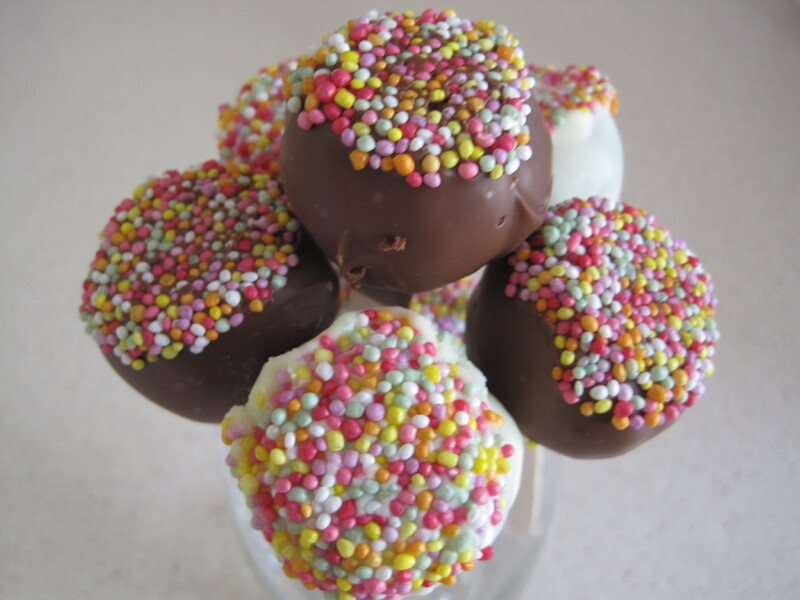 I placed paddle pops sticks into each ball then popped them in the freezer for about 20 mins or so while I melted some white and milk chocolate in tall glasses (I use whitakkers and Nestle chocolate). I took the cake pops out the freezer then dipped each one straight into the melted chocolate to cover completely, then into a plate of natural coloured 100s and 1000s. The cold cake helps the chocolate set quickly onto the cake pop. I then placed them into the fridge for a few minutes to firm up. I also found some aeroplane jelly mix with natural colours and flavours, so made a few of those up, topped with fresh cream, then sprinkled with 100s and 1000s. Needless to say it all went down well, and was a nice change from the boring chocolate cakes I used to do (although I did get pretty creative with chocolate and buttercream icing). If you are interested in reading more about additives found in foods and which ones are known to cause adverse reactions, the food intolerance network website has a comprehensive list. Heres to many more colourful homemade birthdays! in my opinion, homemade is always best, its fresh, and better tasting, and safe – after all you know what went into your products. Can’t get safer then that.